This pack is largely based around progression into the three academic fields. Embark into a world of technology as you work your way through the progression as you dive into nuclear fission and eventually into outer space as you find strange technology from other races.. Is that a... Stargate? Delve into the dark arts or maybe a celestial being as you work tie the line between ancient magics and blood sacrifice. How far are you willing to go to find out the truth hidden behind the veiled door? Explore a land full of promise and green groves, maybe a touch of animal husbandry might take your fancy. Or feeling the buzz of summer with an in depth expansion into forestry's bee's. Feel the rustle in the tree's as you sweep through your greenhouse and feel the tingle of magical crops. With this pack you may find that not all is what it seems, when it comes to experiencing the three academic routes. You may find that all paths link up sooner rather than later.. This pack is multiplayer friendly. This pack is still in development as I tweak configs and work continuing the line of progression. This pack will be updated every tuesday with updated mods. All mod authors own their respected mods. can any one tell me how to get IC2 uranium? haven't seen in in the overworked or the mining world. the guide said I should have mined it... when I got to the point in it to make an IC2 reactor. I have plenty of Immersive Engineering Uranium but the IC2 machines won't process it. hi guys, can anyone tell me how to make a magma crucible? i have to make pulsating propolis but i cant make that. i have made the ender queen but i steel need end flowers, dont see how i can get them, anyone knowS? Is there a place to put crash reports or report issues? My game crashes when right clicking on the core sample drill from Immersive Engineering. If there is a place, I will put the crash log there. - Is this abandoned ? - What are the explosions I hear ? So, apparently this is the Special AI mod. A very bad mod to put in a pack without warning the user. Definitely need to put big flashing warnings about it in the guide. So, you (the user) can just delete it, or make use of its config file : thankfully it's highly configurable. Hi! I just play this pack yesterday. I've found that creeper will rush into light source (eg. torch) and explose itself no matter player close by or not. I don't know if it is the "feature" of this pack or my imagination. Also the neutral mob (cow, sheep, chicken etc.) will be hostile if you attack them or their companion within range. How do i turn off that weird camera sway thing, even though my mouse isn't moving my screen does. Would anyone know if he took out uranium ore or not? Haven't found any at all during mining. Do I actually have to make bees just to get uranium? Any idea why the mobs are in slowmotion when i hit them with my sword? Any idea on how to quickly cut down the massive trees? The lumber axe just doesn't cut it. (unintended pun). how do i get obsidian? ...how do you make charcoal in this modpack? Specifically a charcoal pit from forestry, made by 2x2 wood piles covered in loam. Gives charcoal and ashes. Are there any plans to add Actually Additions to the modpack? Do you see a place for it? How would I balance it? 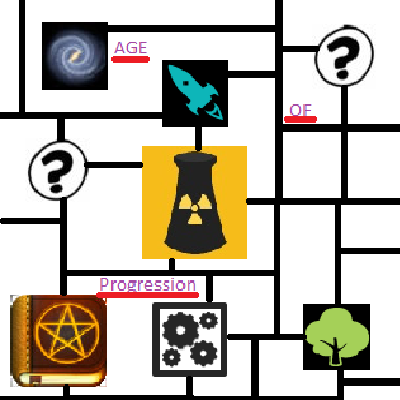 Where would it sit in the progression tree? Does it have minetweaker support? Will it be a goto mod or will it not be used? How will it compare to things on the same level? Config options? you can try to take age of engineering approach.